Two eggs, cheddar, roasted tomato and smoky sweet bacon on your choice bagel, ciabatta or wrap. Grilled sourdough, mashed avocado, and tomato topped with crispy bacon and sunny side up eggs. Grilled tofu seasoned with smoked paprika, caramelized onion, roasted red pepper, vegan pepper jack cheese, organic spinach in your choice of wrap. 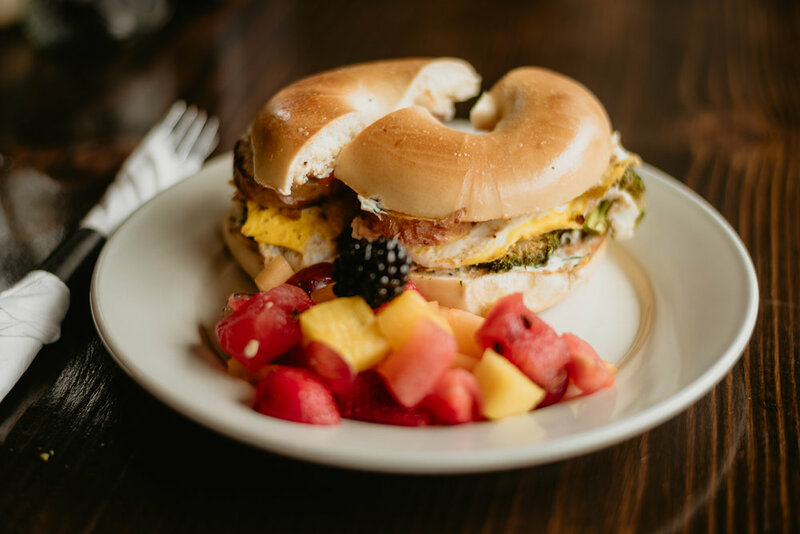 Two eggs, bacon, gouda cheese, organic spinach, grilled tomato, on your choice of bagel, ciabatta or wrap. Two eggs with tomato, mozzarella, arugula and pesto on your choice of wrap. Add bacon or sausage. Both come with chips & Apple & Eve fruit juice. Roasted chicken breast, tarragon, grapes, cranberries, walnuts and mayo on romaine lettuce with sliced tomato and house maple balsamic dressing. Mixed greens topped with tomato, cucumber, and red onion. Includes choice of chips, fresh fruit, or small side salad. Roasted chicken breast with tarragon, grapes, cranberries, walnuts and mayo served on a croissant with lettuce and tomato. Bacon, romaine, chipotle mayo, tomato, avocado on sourdough. Check out our Instagram and Facebook stories for our unique daily soups, quiches, breakfast and lunch specials!